ST. LOUIS -- A band of severe weather was stretching across a swath of the Midwest and South on Thursday, dropping a small, pre-dawn tornado in suburban St. Louis while posing the threat of more to come for tens of millions of residents in the storm system's path. On "CBS This Morning," Eric Fisher, chief meteorologist of CBS Boston station WBZ-TV, said the threat for tornadoes, large hail and damaging wind gusts would continue into Thursday evening and even overnight into Friday before moving east. 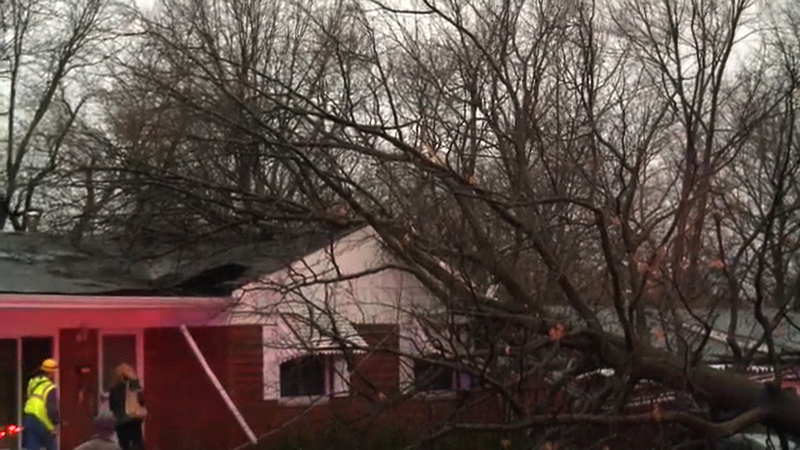 No injuries resulted from the EF1 twister that hit University City just west of St. Louis shortly before 5:30 a.m., damaging about 100 homes in winds that reached up to 110 mph, National Weather Service meteorologist Jayson Gosselin said. That system also carried heavy rain - up to 5 inches in parts of Missouri, prompting flash flooding that damaged dozens of homes and forced at least two water rescues. But forecasters said more was in store, saying unsettled weather could spawn other tornadoes and thunderstorms later Thursday, notably in southern Missouri, Arkansas, northern Louisiana and western portions of Kentucky, Tennessee and Mississippi. "That's where we think (potential of) tornadoes - some potentially strong - will be the greatest," said Bill Bunting, the forecast operations chief for the National Oceanic and Atmospheric Administration's Storm Prediction Center in Norman, Okla. "This will continue to evolve with time." His message to those in the storm's path: "Today's the day weather is important. Pay attention, absolutely." Tornadoes, hail and winds in some cases gusting to 75 mph were possible as part of the storm. By midday Thursday, Missouri had absorbed the worst of the damage in University City, a densely populated St. Louis County area, where the city opened a shelter for evacuees. Gov. Jay Nixon declared a state of emergency and activated the State Emergency Operations Center. Rainfall was heavy over much of Missouri and western Illinois. The National Weather Service said portions of Johnson County, Mo., had more than 5 inches of rain, causing flash flooding that forced evacuation of some homes in the Warrensburg area. Highway T in Johnson County was closed after rushing water washed out three culverts. At least two drivers had to be rescued from water that swamped their cars. Even a three-person rescue team was briefly imperiled when flood debris clogged their jet skis. They eventually floated to safety.